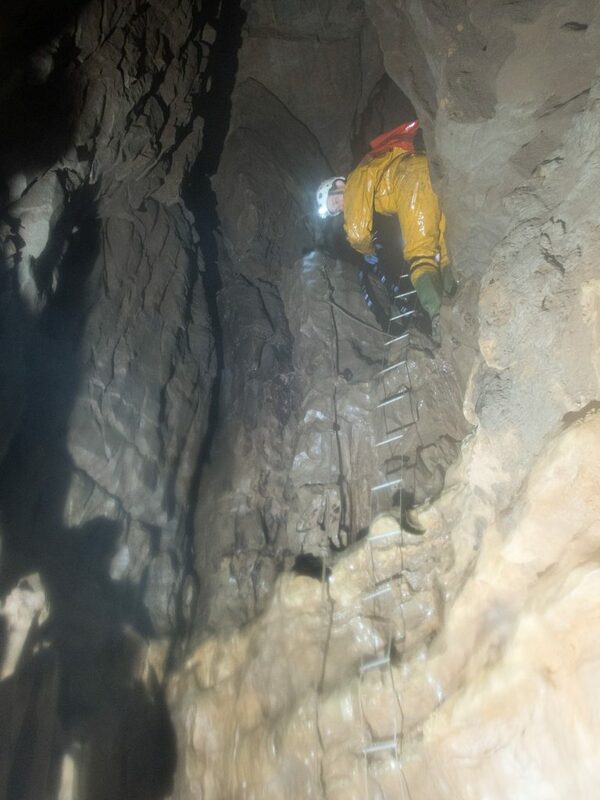 Photo by courtesy of Barry Hill, Hereford caving club. 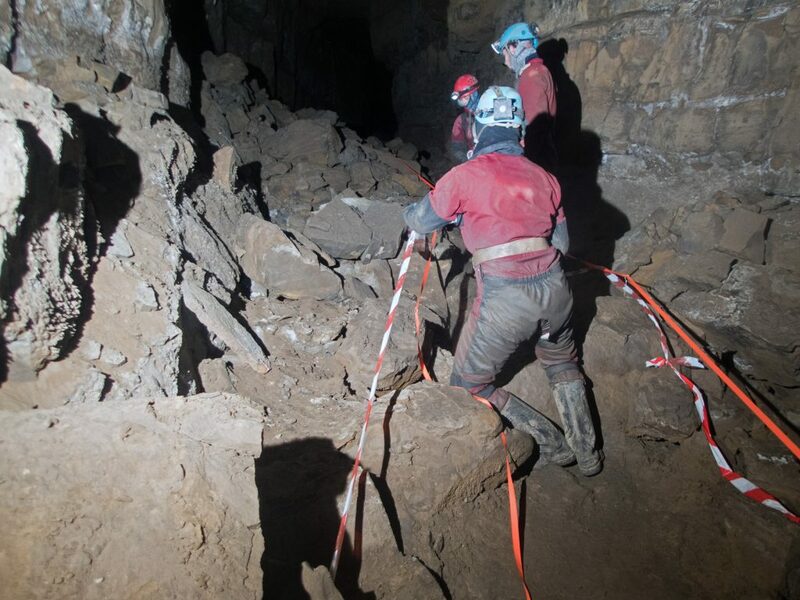 Taping, for good or bad, is a vital aspect of caving that ensures most of the cave is kept safe for future generations, restricting the wear and tear from cavers to the controlled paths. In Draenen, conservation tape has been successfully used to protect the cave. However, the original tape was laid quickly, with little thought for the long-term use in the cave. In the main it has conserved the formations and sediment beds well, but over time the original red and white tape has faded and has been broken in many sections. Consequently, it was time the taping in the system was renewed, especially in the key areas. 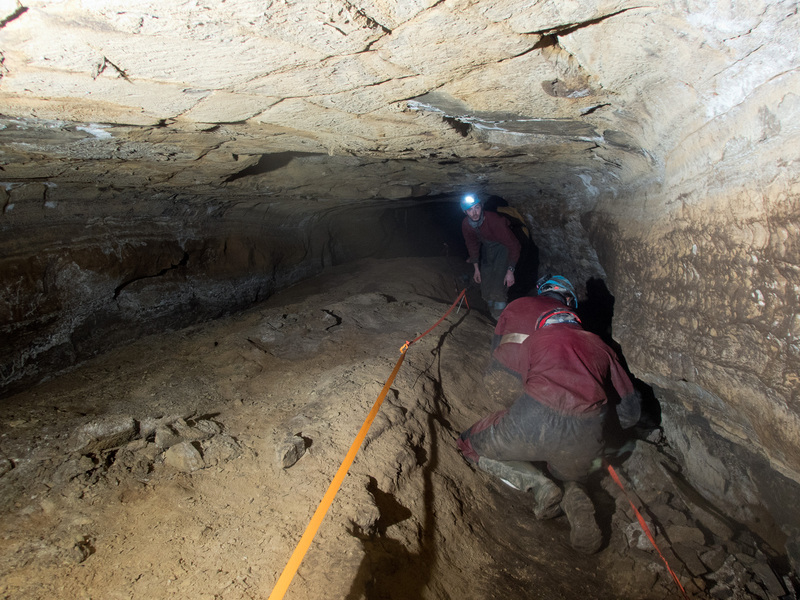 In recently years, in many cave systems conservation tape has been raised above the cave floor on stainless steel pegs in an effort to make the routes through the cave clearer and to deter cavers from straying from the path. However, in Draenen this method of taping has only been used in few sections. One area of the cave that could benefit great from raised tape is Gilwern passage. Gilwern is a major destination for trips and is one of the most populated sections of the cave with formations. So, it was decided to improve the passageway with raised tape. 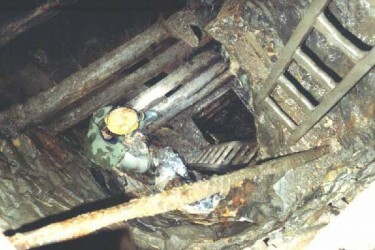 On the 27th January, three teams entered the cave. 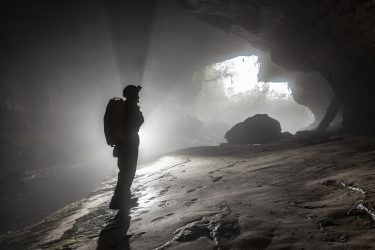 The first team was made up of members from University of Leeds Speleological Association, Hereford Caving Club, South Wales Caving Club (SWCC) and Aberystwyth Caving Club who went to Gilwern. For me, it was a great learning session, as we were lucky enough to have Andy Freem on the team filming the work (the video is below). As Dan yr Ogof conservation officer, he had lots of information to pass on. The goal of raising the tape in Gilwern was achieved and looked extremely good. It now looks like one of those caves that conservation officers dream about. Another team from Oxford University Caving Club (OUCC) went to Yellow Van to clear up an old dig site that had been abandoned. While the final team made up SWCC and OUCC went to Midwinters Chambers to re-tape the passage way after its recent damage and unnecessary widening. Unfortunately for them, someone had recently gone back to tidy up the mess, but without informing anyone that they had done so, wasting time and resources on the day. However, the trip was not wasted, as the team improved the taping in the passageway and re-taped the Nunnery to help conserve the formations there. The day was highly successful. It was a trial run to see if a collaborative conservation day would work. We had 16 people attend the event from five clubs around the UK. We placed over 200 stainless steel pegs and laid over a kilometre of ‘conservation’ flagging tape. However, there is still plenty more of the cave system left to do. Thanks to everyone involved on the day! The next conservation day will be held on the 17th February 2018. 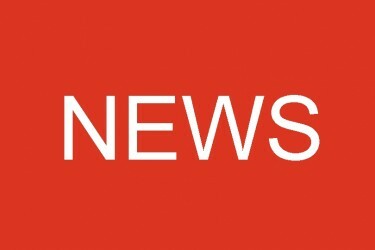 Correspondent: Joshua White, PDCMG Conservation officer.